One of my favorite movies from last year, Red has it all: great cast, comedy, action, smarts, heart and, did I mention great cast? Here’s the lineup: Bruce Willis (Armageddon), Helen Mirren (The Last Station), Morgan Freeman (Seven) and John Malkovich (Secretariat) as retired CIA agents (Retired and Extremely Dangerous — RED) and Mary-Louise Parker (TV’s Weeds) as Willis’ object of desire and well-intentioned kidnapping. 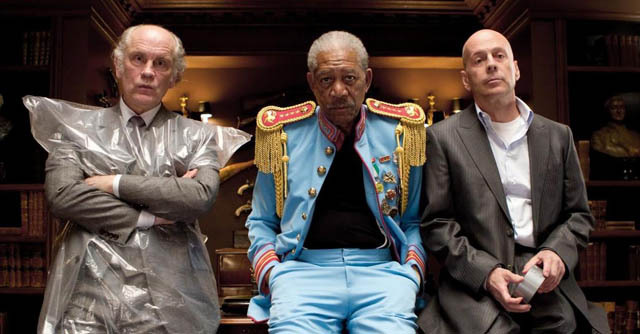 All perform their roles brilliantly, especially Malkovich, whose out-there character (he lives in a bunker under a car) is so much fun to watch. In smaller but equally memorable roles are Richard Dreyfuss (Jaws) as an evil rich guy, Ernest Borgnine (The Dirty Dozen) as the CIA records keeper and Julian McMahon (TV’s Nip/Tuck) as the whiny vice president. In the movie, Willis, Mirren, Freeman and Malkovich must come out of retirement when someone tries to kill them. Packing lots of heat — and whatever other weapons they can get their hands on — they must unravel the mystery to stay safe. The action is fast, the script is smart and the laughs plentiful. But it’s the actors and characters that make this film so enjoyable. Mirren as a Martha Stewart-esque lady pulling a huge gun out from behind her vase is priceless. All the actors look like they’re having a grand ole time in the movie. It’s like what The Expandables should have been, taking itself much less seriously. Rated PG-13, Red, which is based on the graphic novel by Warren Ellis and Cully Hamner, was ignored by the Oscars, but who needs one? The film grossed $90 million in theaters and should be embraced wholely on DVD and Blu-ray. The “CIA Exposed” featurettes reveal the nasty little secrets the agency has kept over the years, such as the MK-Ultra mind control experiments, assassination plots and law-breaking activities. The CIA is also discussed in the commentary by retired CIA field officer Robert Baer, who says he retired after a failed assassination attempt on Saddam Hussein and, when he arrived home, the FBI tried to arrest him for attempted murder. “When your employer’s trying to put you in jail, it’s time to move on,” he says. He follows the film with an eye toward how realistic it is about the life of retired CIA agents, and he says it mostly passes muster. The final special feature is an interesting trivia track that can be played throughout the movie. Don’t expect behind-the-scenes tidbits. Here you’ll learn about famous retired CIA agents, the cost of the various damage caused in the film and the price of the most expensive purse in the world ($1.9 million), among others. A shame that copies for rent contain NONE of these special features. In fact, it does not even have a lossless 5.1 audio track! Reviewers are the lucky ones.